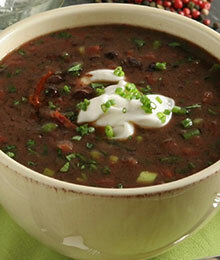 Soak about 1 and 1/2 cups black beans overnight in water. Bring to boil then turn to low and cook for 90 to 120 minutes until soft. Cook with plenty of water... at least a couple inches above top of soaked beans. Do not throw out extra water. Preheat oven to boil on high. Move rack to top fitting. Place in large bowl and add about 4 tablespoons melted coconut oil and a pinch of salt. toss and place on large roasting sheet. place in oven on top rack to broil for about 30 minutes, turn a few times as needed for even browning. Remove about one half of the cooked beans and mash or blend in processor. Return mashed beans to rest of beans and add about one cup of beef or chicken stock to desired soup consistency. Keep heat or low or medium low to keep warm. When veggies are done, cut into large, bite sized pieces and add to the beans. Add about 3 tablespoons sour cream and stir to blend in well. Serve with freshly sliced avocado, sour cream and cilantro. Can also be served with a taco-seasoned, grilled chicken breast on the side if desired.